Today is the day…6 weeks in the making! Our One Room Challenge Kitchen Makeover Reveal is finally here! If this is your very first visit to my blog, WELCOME, I am so happy to have you! You can check out Week 1, Week 2, Week 3, Week 4 and Week 5 to see all of the action in progress. I’d like to say a BIG thank you to Linda from Calling it Home for hosting such great party. I have admired all of the bloggers who have participated over the years and this year decided to join the fun..aka DIY’er hay day. Our BIG wow for this room has to be the planked walls. My husband worked so hard to complete my plans and knocked it out of the park. The side walls weren’t as hard as the back one. That back wall is really tall and has the windows. Cutting all of those curves were an undertaking but he did it like a champ. We did the same wood planked wall for our Beverage Bar that I posted about on Monday. I will write a full post about how we did both of those but first I have to gather my self from this kitchen makeover. Let’s take a look back at what this room started as. Not bad at all, I just needed a change after 7 years. By the way, that Cookie sign went right back to that spot…I love me some cookies! 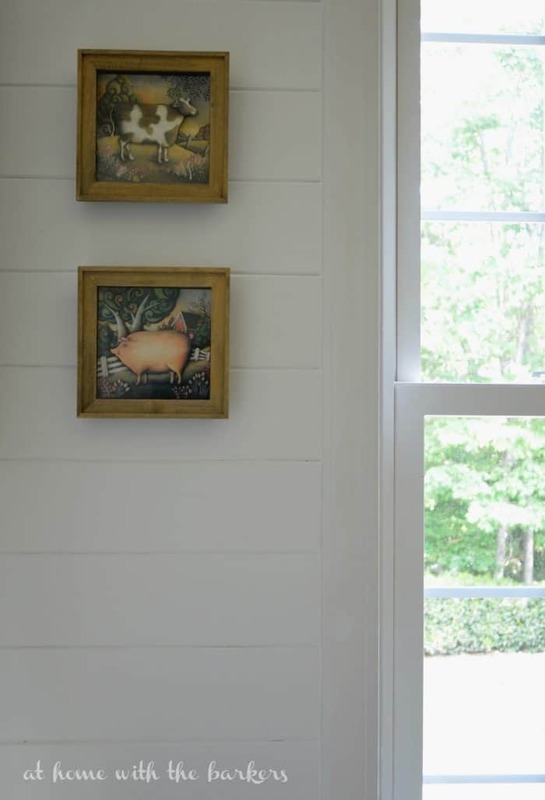 I painted the planked walls in an almost white color called Blanched Pine (Valspar color.) 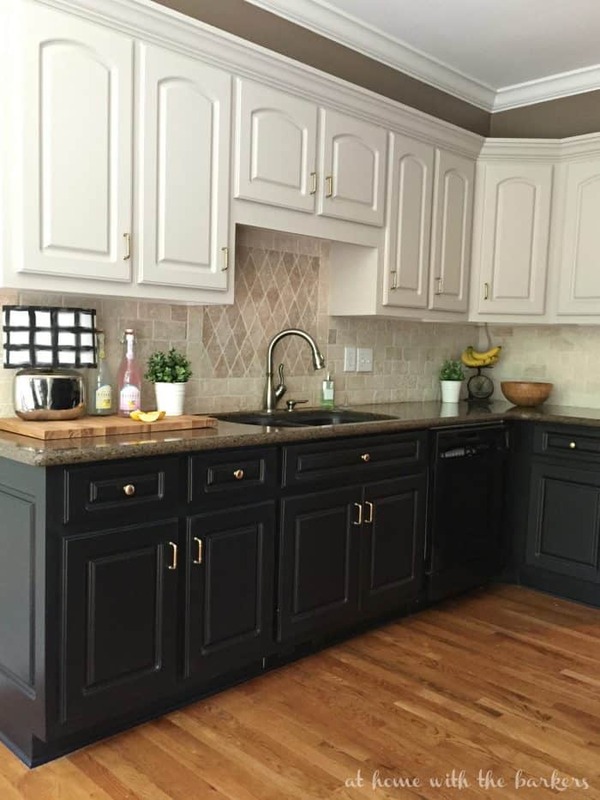 I LOVE the contrast of it with the black and gray painted cabinets. 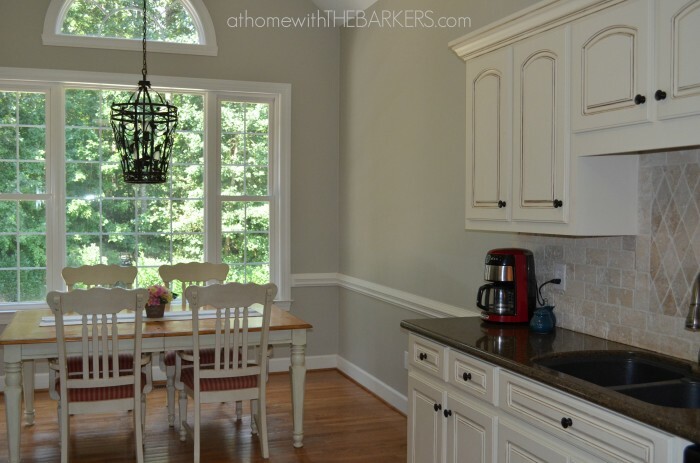 I used DecoArt’s Americana Chalky Finish paint for the cabinets. Carbon and Primitive were the perfect colors. 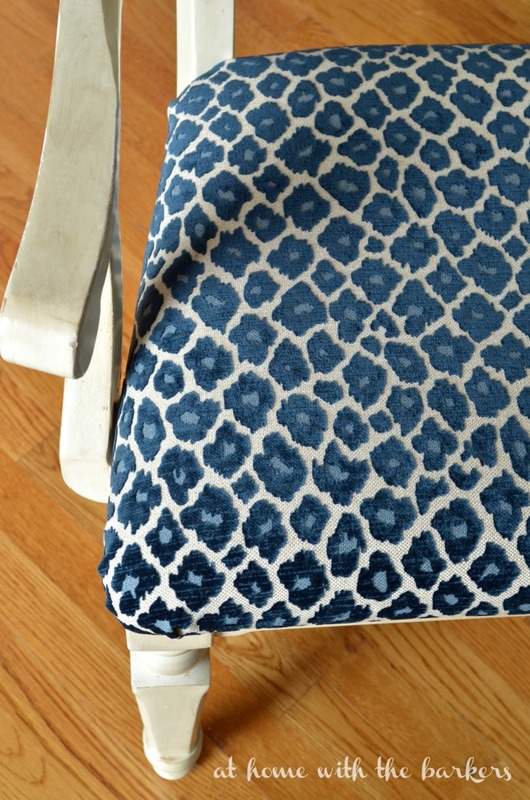 AND this fabric I used to recover the chairs…Oh la la!!! I have a about 1/4 of a yard left over so I am hoping to embellish some sofa pillows with it. I’m feeling the need to sew again. At least that won’t involve my hubby and he will be happy about that. In a cost saving, budget friendly manner we knew we had to keep the counters and backsplash. They really are pretty and there was no reason to remove them. One year until our first born heads to college calls for being money savvy. So I chose the wall color to keep the room neutral and to tie in the those two elements. It is the perfect light brown. It’s called Down Home from Sherwin Williams. Are you swooning over that hardware? Back Story: I made a huge mistake when I ordered my hardware and when it came in the mail last Thursday it was way too dark. I thought it was going to be a bright bronze but it was dark. It did not show up on my black cabinets. After a freak out email it was all taken care of. THANKS to the awesome peeps at Hickory Hardware they hooked me up with an entirely new order and sent it over night! THANKS MISSY, you rock! I ended up choosing the Cottage Collection Satin Rose and I LOVE them. 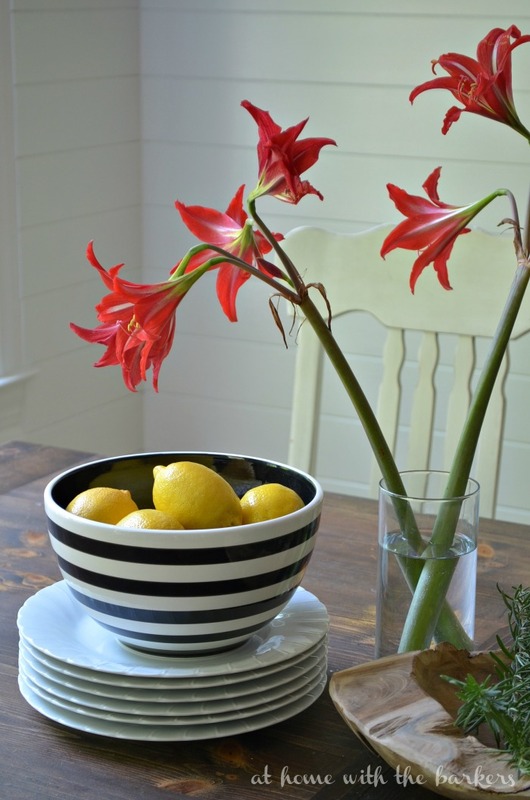 Found the ceramic black and white striped bowl at Ross for $5.99! I would have loved to have found it in coffee mugs too. That lamp was a last minute DIY. I had the lamp in the attic that I had purchased on clearance from Target. I was inspired by Emily McCarthy’s house tour in the new HGTV magazine. I’ll be sure to post all about it soon. I have plans to cut that piece of butcher block in half and use them when I actually cook. It was left over from our beverage bar. I am really thrilled with how it all turned out. Now I have to start working in my yard planting and cleaning pollen. If you step to the left of this view of the stove there is a doorway into the hall. There is a pass through between this hall into my dining room and that is where the under stairs closet is located. That is the space we turned into the Beverage Bar. Here is a view from the hall. I plan to also use this area to serve for parties! Now that the kitchen is complete, my husband had a great idea for us. We decided to start cooking together on Friday nights and try new recipes. I’m excited for that because I really don’t love to cook…wink, wink! Your kitchen is real beauty. It is a true testament to the power of paint. Never ceases to amaze me how much paint can really do to transform a space. And that planking is fantastic. Can I ask you in advance of your tutorial what type of wood did you use? You are so sweet! We used 1X6 Pine tongue and groove planks. I went with the mid grade bc I didn’t want any knots in the wood. I wanted a smoother look to the wood. Loving that planked wall! Just goes to show you a little DIY goes a long way! Amazing job! It’s simple things sometimes that make the biggest difference. Thanks for you kind comment. Beautiful makeover Sonya! I love it all, especially the cabinet makeover, and planked walls. Enjoy! Love it! I have the same black paint that I’m using on our kitchen island. Plank wall is gorgeous!! You will love the paint. Are you using the Soft tour varnish? Nothing short of spectacular! You really did a good job on the cabinets (and everything else for that matter). They do not look like a chalk paint finish in the photos. Did you do anything special to give them that nice smooth sheen? Great job. My trick also is to paint the first coat with a brush then the second coat of paint with a sponge roller. Also, the soft touch varnish from DecoArt gives this wonderful finish. Gorgeous. I love the white and black on the cabinets, so perfect. 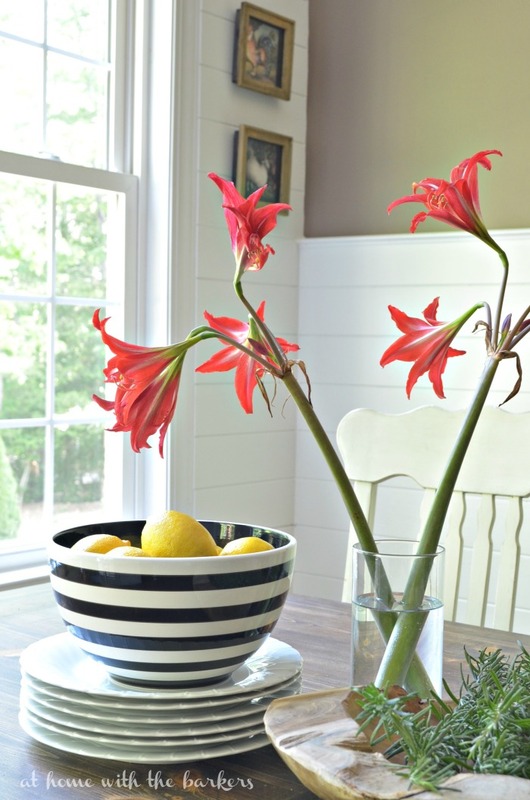 Such a pretty kitchen and fabulous makeover. Thanks so much Marty! I am pleased with how it all turned out. 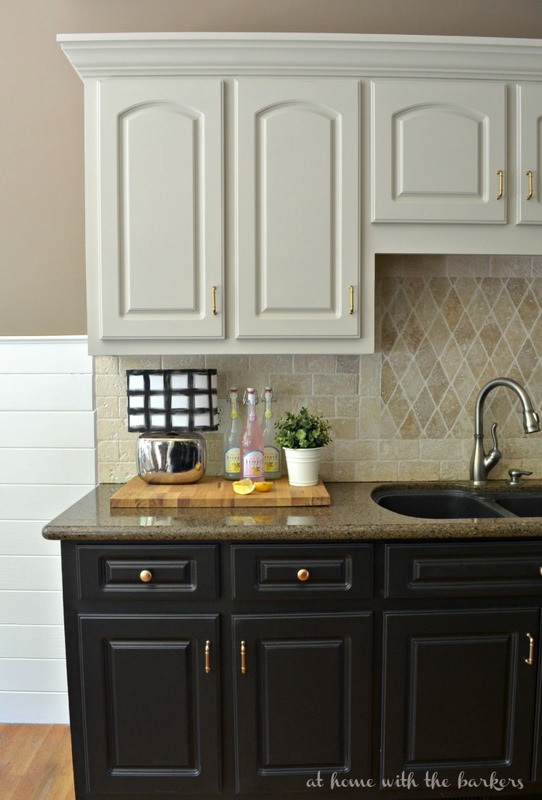 The two tone cabinets are fab…and the 1/2 plank wall…oooohhhhh! Fantastic! The space looks so much brighter now. 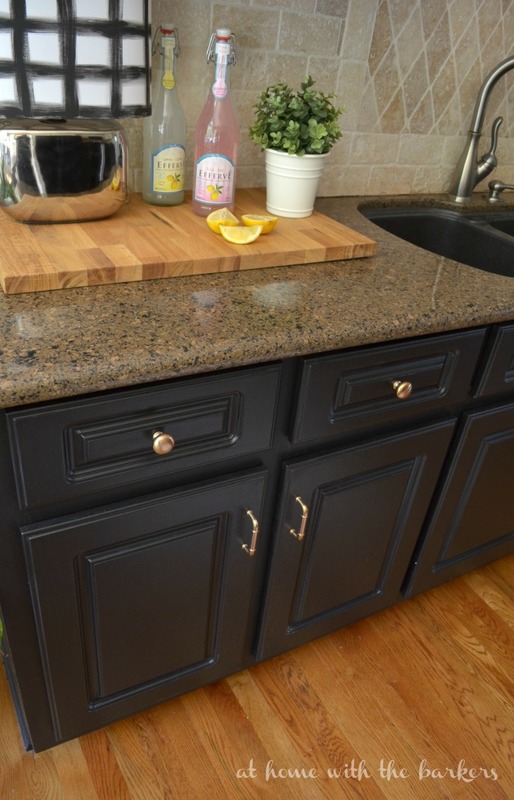 I love how you painted the bottom cabinets black! Thanks so much Anna! I had wanted to do it for 2 years…I needed the push! Your kitchen is fabulous Sonya. 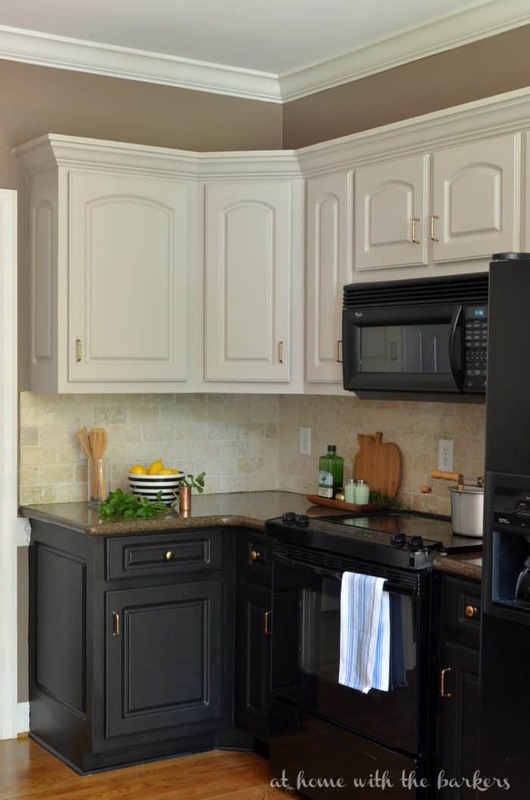 I love the contrast between the black lower cabinets and the creme uppers (I did the same in our kitchen). 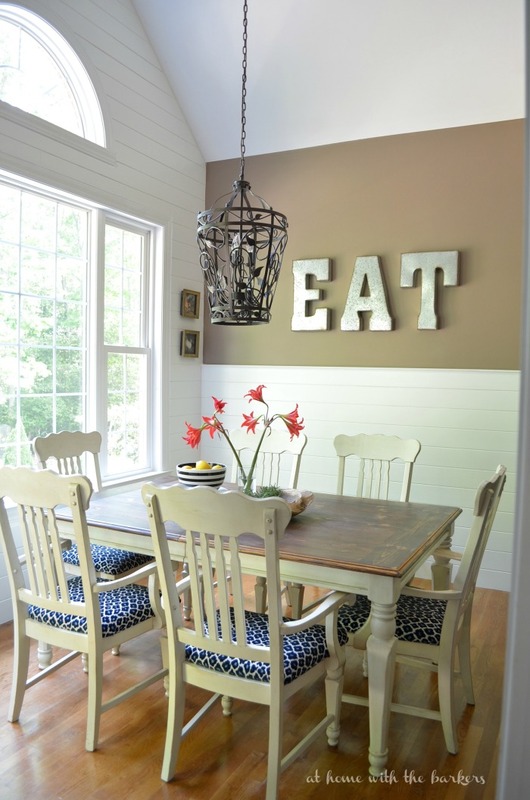 The plank walls add so much character to your eating area – just love them (and kudos to your husband for the cuts along that curved window). I remember your coffee bar that you shared earlier and have been thinking about where in our little kitchen I can carve some space for one. Really enjoyed this series and seeing how your kitchen was coming along! Your kitchen looks fantastic, Sonya! Your husband did an awesome job on the planked walls — good thing you don’t live nearby or I’d be bugging him to come to my house – lol! Love how your kitchen turned out — the cabinets are perfection. Great job! OMGosh…this is so good!! Love it..well done!! this is amazing!! LOVE IT. 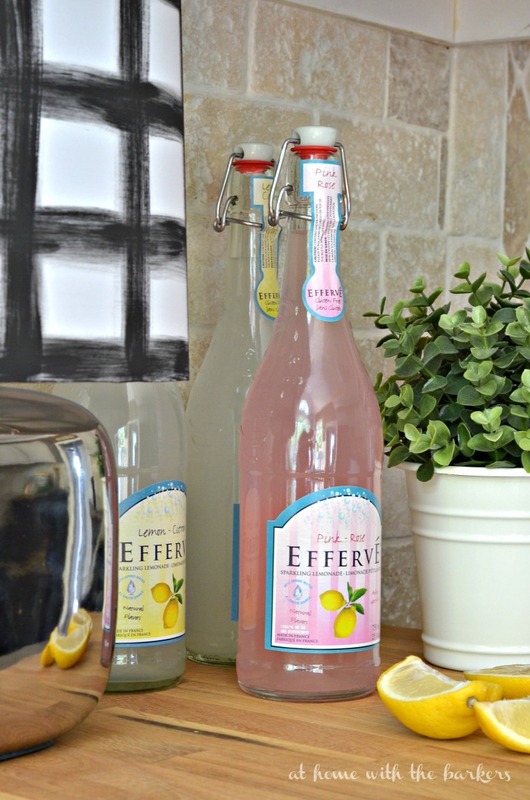 Can you show pictures of your beverage bar and where is it located? Thanks Friend! I added some details and a photo to describe it better at the bottom of the post. You can read all about it there! OR stop by on your way home 😉 and see it in person. Love, love, loooove the black cabinets! And major props to the hubs for the planked walls. You did an amazing job!! All I can say is wow ! I love it . Your Hubby did a great job on the planks. That wall with the curved window is to die for. Love the color of the cabinets also ! Great job ! Love that beverage area, so much so I had to pin it to 2 different boards. Great job on the kitchen! It’s beautiful! I love the two-tone cabinets. They just add so much more interest to the room. And the planked wall is great too! Great job! So sweet, thank you for stopping by! Love what you did with the space. Looks great! I especially love the light fixture. Where did you find it? That light fixture wasn’t a new piece. I have had it for years. I bought it at either Home Depot or Lowe’s. It was intended to be a foyer light. Just think outside the box when you are looking for lighting! I love all the colors and how you tied it all together.The new hardware is wonderful, your walls in the dining room are great and so are your chairs,it makes me want to do something to my kit.and dr. lol It was all well worth the wait, thanks Sonya i know you both worked hard and it shows. Beautiful transformation! Love the planked walls, dark grey on the base cabinets and your dining chair fabric – all so perfect! Kudos! 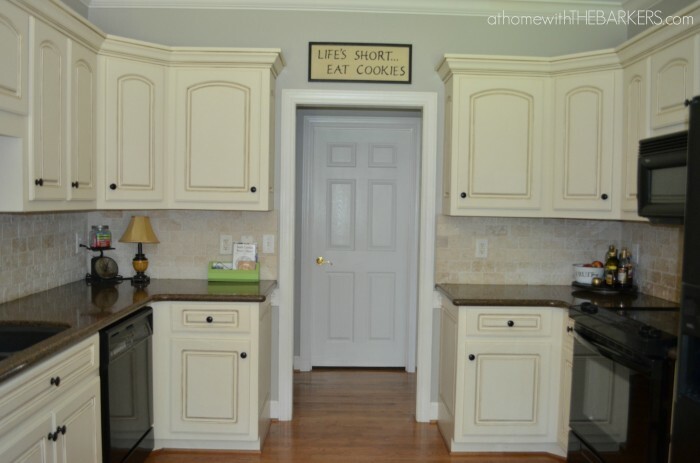 Ahhhhhh, love the cabinets! That black really pops, and the hardware pops on the black–your kitchen is just popping all over the place. The plank wall turned out great, too! Great job! Love the chair print and the dark bottom cabinets! Looks amazing! This looks great!! 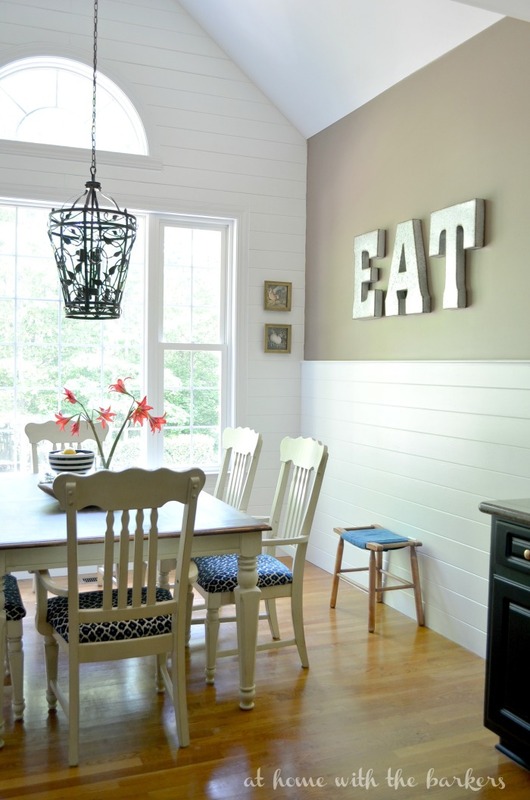 Love your backsplash and the “EAT” letters! And that planked wall – gorgeous! This turned out great! I love the two toned cabinets and the planked wall. Great job! sonya- congrats. your kitchen looks amazing. No doubt that you are a happy camper when you are whipping some dinner up in there! It looks fantastic! Great color choices! The kitchen turned out beautifully, Sonya! Kudos to your husband on the planked walls. 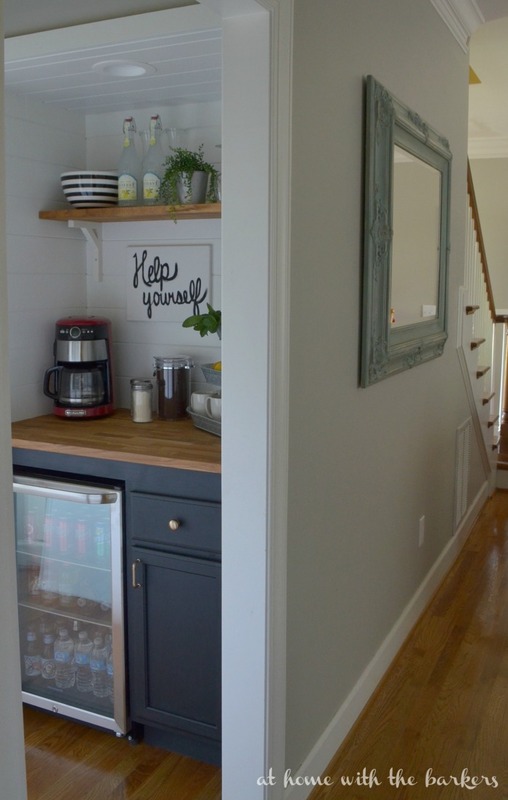 The beverage area is such a fun idea–I want to add a small fridge to our kitchen like that at some point. The view out your window is so pretty–love the trees! Hi Sonya, this is an impressive kitchen. That plank wall with the eyebrow window is amazing. I also love the beverage area. Fantastic job. Even more impressive is the fact that your husband and you will be cooking together. I love that. Happy cooking. Thanks SO much Linda for allowing us to link to your amazing party!! So much talent in one place! Your kitchen turned out amazing Sonya. I love every last detail. Your husband did a great job too on the planked wall! Nothing like a new and improved kitchen! I mean seriously we spend so much time in this space and now it can be your happy place:) Love all of the changes and Lord….it was hard work I know! Congrats! Sonya this looks fantastic! You did a beautiful job my friend! 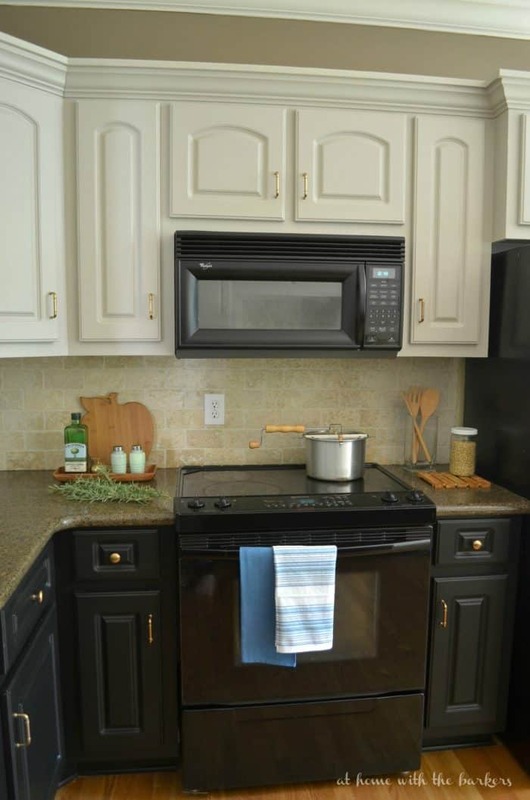 Totally love the updates you did with the cabinets Sonya! Just perfect! Wow you were busy!!! The kitchen looks fantastic!!! So clean and fresh! Sonya, WOW. Just wow. Your kitchen is beautiful and I wish I could pick out one thing I love the most but it’s all so gorgeous! Great job!! Thanks so much! I appreciate your kindness. Well done Sonya! Your re-do turned out great! My favorite parts are the beverage station and the new fabric on the dining chairs! 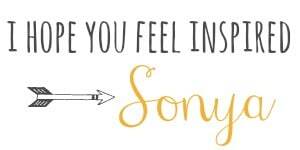 This looks so beautiful, Sonya!! I love all of your thoughtful touches! The beverage bar, the plank walls, and that black and white bowl may be my favorites!!! I LOVE, LOVE, LOVE it! I agree 100% … the planked wall totally make the space! Love the black on the bottom cabinets. It really brings definition to the whole lower element with the blank sink, the appliances and the black flecks in the granite. Your makeover is amazing! Love love love your plank walls also!!!! You may have just inspired me to do a wall similar to your short one. Did you make your EAT sign?? Thanks so much. Any painted surface can scruff or scratch, no matter what you put on it but I have had great success with this paint! I highly suggest it. The EAT letters are from Hobby Lobby. Thanks so much! I sealed them with the Soft Touch Varnish from the same brand. As with any painted surface, especially high traffic areas, there is always a chance of scuff marks but I have a bench painted in the same and it has held up very well, even with my dog climbing on it. I love the colors you chose and the plank wall! Inspires me to make some changes! 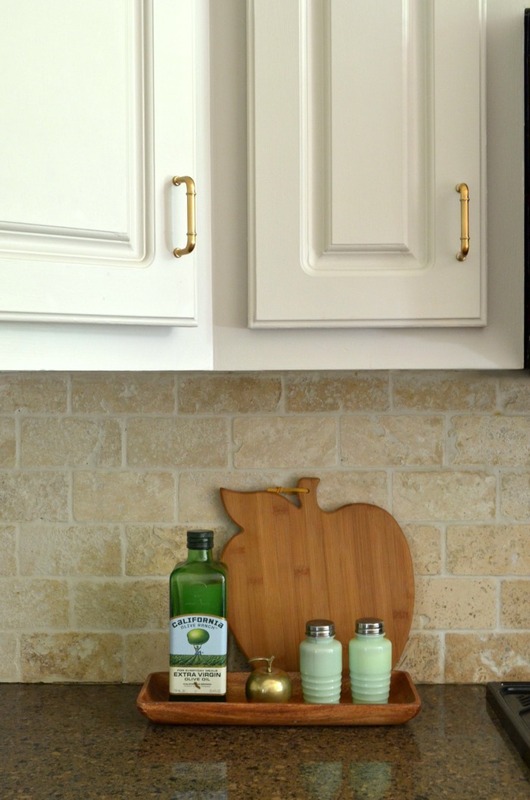 I am curious, you mentioned that you might change the counter tops/ backsplash later…what would you do next? I’m thinking of painting my cabinets similar to yours but need new counter tops and am looking for ideas! I would lighten the counters to include more white/cream because I love the brightness of the planks walls. I have considered painting the tiles white but just thoughts right now. What I love is how your black appliances tie into the black bottom cabinets. They just blend in….looks amazing! question….did you just use the varnish? or wax and varnish? No waxing, just the soft touch varnish. So sweet, thank you! I love that bowl too. Thinking of doing a smilier two-tone in my new kitchen which is currently oak cabinets. There’s one cabinet that keeps tripping me up, though. It’s a tall cabinet that is not disjointed by the countertop. Would you opt to paint it black (as are all the appliances) or opt for the lighter color to go to the floor? Help! I think that one could go either way. It would depend really on if painting that cabinet black would make the room feel too dark. I loved the before pics and I love the after pics….. but I see this is from 2015…… my kitchen looks much like your before pics… Sooooooooo if you were to update TODAY what would you do???? Same colors? I plan to repaint them in the fall. I think I am going white. I do however still love my original glazed cabinets and I would consider that again too. I think it’s a classic look.